I was standing outside in the cool, fresh morning, surrounded by the fiery trees of a New England autumn, while overhead a commercial jet drew its arrow-straight vapor trail across a pale sky feathered with wisps of cloud. And I was thinking, inevitably, of F1. Formula1.com has done the unthinkable and released more video of the three controversial incidents that attracted penalties in Fuji and the debate has been re-ignited as a result. F1 Fanatic has a good post on this, together with pages of comments, of course, and, for those who want a bird's eye view of the first corner kerfuffle, Vee8 has a link to Ed Gorman's article in the Times, which includes footage from the helicopter, as well as Massa's in-car view. All this serves only to confirm me in my opinion on the incidents and penalties. The only additional information the videos give is that there was plenty of room for Hamilton to pull out of Raikkonen's slipstream, as he was ahead of Kovalainen by that stage, plus the helicopter shots show us what happened to Hamilton at turn 3 that left him sandwiched between Massa and Raikkonen. 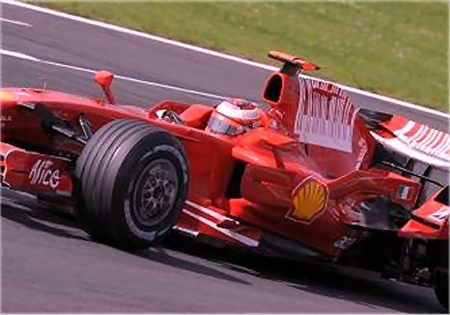 My thoughts were rather on the character of the leading lights of F1 at the moment, especially that enigma, Kimi Raikkonen. With both Hamilton and Massa being accused of immaturity, it struck me that what has happened to Kimi in the last couple of seasons is that he has grown up. It is so obvious that I could kick myself for not having realized it before. Consider that, during his McLaren years, Kimi drove very much as Hamilton is driving now, brilliant on his day and then throwing things away with rash moves that looked silly in retrospect. How different a driver he has been at Ferrari, particularly this year - so much so that we have talked of a loss of motivation and perhaps even upcoming retirement. But it is that first corner incident at Fuji that really shows what is going on with the Finn. Many of his supporters have pointed out that Kimi prevented an accident happening by steering clear of Hamilton through the entry to the corner. That is only common sense but many hotheads would have fought harder to try to reclaim the initiative - and the result would have almost certainly been a collision. There was a time when Kimi would have done exactly that and ended up with a wounded car. But not now. Not only does Raikkonen give Hamilton room to overshoot, he also does not fight Kovalainen when he comes through. It is quite clear that it has dawned on him - the objective is to survive and finish the race. Hamilton and Massa may know the words but the meaning has still not sunk in; they are still learning to control and direct their urge to compete and so it is quite correct to say that they are immature. And so Hamilton should be, at least. He is still young in a sport where most drivers do not become champions until the second half of their twenties. Alonso has disguised that fact over previous years by grabbing his championships very early on, but he is the exception rather than the rule. It is less easy to forgive Massa his mistakes; he has been in F1 much longer than Hamilton but still has those rushes of blood to the head that result in tears. The fact that he is incapable of admitting his mistakes only adds to our impression of him as somehow not quite worthy to be champion. So where does Robert Kubica fit into all this? He is, after all, the last hope for those who would not be happy to see either Massa or Hamilton take the championship this year - how does he do in the maturity stakes? His stock is high at the moment, thanks to a steady and consistent season and an epic battle with Raikkonen at the end of the Fuji GP. But that could change if he too makes a rash move in the last two races this year. The thing is, however, I do not think he will. Robert had a hard climb to get into F1 and is bound to have learned a lot about life as a result. His first year in the sport was also a tough taskmaster - he paid dearly for his mistakes, most notably in the Canadian GP of 2007. And he seems to have taken the necessary lessons from his experience; in many ways, it was fitting that his first GP win should come at the scene of his spectacular crash last year. So it is not surprising that so many have switched their allegiance to Kubica over the course of this season. But it is Rakkinonen who now demonstrates the greatest maturity, very clearly in his public utterances. When asked whether he agreed with the penalty given to Hamilton for the Fuji incident, Kimi refused to say, claiming not to have seen the whole thing. This from the man who was most definitely "on the spot"! Compare that to Massa's pathetic attempts to put the blame on anyone but himself for his mistakes in Fuji. About the footage at FORMULA.COM, as you said, it doesn´t change my mind too. But I find out that with this video, the guys from FIA are trying to convince us that they´re only a bunch of incompetents instead of bunch of corrupters. Hi Clive, My hats off to you, that is one of the best, most level headed F1 editorials I have ever read. Hamilton is also an exceptional talent, you'd have to be insane to say otherwise after his performances since he arrived last year, to match a double world champ (in the same car) in yer first season is an incredible achievment, not to mention only losing the championship by 1 point, is just jaw dropping. What I'm getting at hear is that I think they would both make valid world champs (and it pains me to say it) but not this year. Becken: I find it a hopeful sign, that they have released those videos. Maybe they are beginning to hear the storm of protest over their awful decisions and feel they have to justify them somehow. The only problem is that stewards' rulings that are so obviously at variance with the facts are impossible to justify, no matter how many different angles of video they release. George: I, too, would enjoy it most if Kubica were to be champion this year. Apart from anything else, it would at least mean that my pre-season prediction was correct in that the car will be a BMW! But my head says that Lewis will get it in the end. He must surely have learned a lesson from Fuji and will be a very hard man to beat in the last two races as a result. Plus, everyone says that Shanghai is a Ferrari track and Interlagos belongs to Massa - and they've been wrong about such things on almost every track so far this year. The smart money has to be on Hamilton. My thoughts after viewing the video. Lewis- Bad move, not nearly patient enough....It's the FIRST corner, not the last one. Your leading the championship, what are you doing risking it all after last year??????? Kimi-Brilliant job, even though he lost 6 spots on track. Very mature of him. Lewis/Massa spin-Shame on Massa. He should have conceded the position. Chances are Kimi would have let him in and that is better then a penalty any day. Seabass/Massa spin-racing incident. I don't think he saw him coming in from the far right pit lane. Why no flag to tell drivers a car is entering the track? Their view seems limited as to how far their peripheral vision can go. Your remarks about maturity and 'hot heads' are prolly spot on. I would go even further to suggest that some nationalities are generally more 'emotional' type personalities than others, and I think we see proof of that time and time again both on and off the track. Even though I'm not particularly a Hamilton fan, I hope he wins it this year. If he does it will be a truly remarkable achievement. Beating a crooked house is not easy to do. Sadly, I doubt if the powers that be will allow him to win. They've shown they have absolutely no shame and I expect them to continue in this vein. I suspect Massa will win. At the moment he has Mosley, Donelly, the stewards, the gagle of Ferrari lawyers, Alonso and Rakkinonen all commited to his winning. Pretty hard to beat that much of a loaded deck! I love the fact that the F1 site has the headline "What do you think?" and then provides no way of actually telling them what you think. The videos just prove what every reasonably intelligent person knew anyway. Hamilton made a big mistake at corner 1 just like most of the other drivers did and just like incidents that happen at practically every other race start (kimi forced massa off the track earlier in the season in a very similar but possibly more planned incident). Anyone who thinks this deserved a penalty clearly does not watch much F1 (or indeed any other type of track racing). Also one of the torro rossos went off track and rejoined clearly in a better track position (i think it is bourdais) yet no penalty for gaining an advantage. Massa could easily have gone straight on down the run off road at the chicane, but chose to try and get the place back (However you could argue that he was just trying damage limitation by remaining on course). I am pretty sure he did not do this on purpose however if you listen to the audio from the in car view it sounds very much like he is accelerating hard just before he goes off course and hits hamilton. Bourdais was well into the corner by the time massa came across and hit him. Massa would also have been able to see him as he was coming down the straight. The worst incident of the day though was Massas pass on webber. This was the only one which was dangerous and I have now discovered that it was indeed investigated. However it was webbers blocking that was investigated not massas off track overtaking move and consequent foray into the safety hatchings. If a car had been exiting the pits we could now be left with 2 dead drivers rather than an argument about the stewarding. Now if webber was cleared of any wrong doing by the stewards then surely this confirms that massa was not pushed off the track and chose to take the off track route. He however was not punished. been guilty of causing accidents. It is part of the game. This bullying is ridiculous. I guess the kids on the playground are following the example of Mosley. Since he can be unfair toward Hamilton and McLaren, the rest see them as fair game too. As I've said before, I am not particularly a Hamilton fan, but I hope he wins it all to shut up the rest. What is a pity is no matter who wins, the whole business is so tainted that the championship is becoming no more than a joke. Planet F1 did an analysis of the stewarding and came to the conclusion, "Felipe Massa would enter the final two races of the season knowing that he had to win both to have any chance of the title while Hamilton, leading 93-73 in our alternative, would require just a single point to clinch his first title."